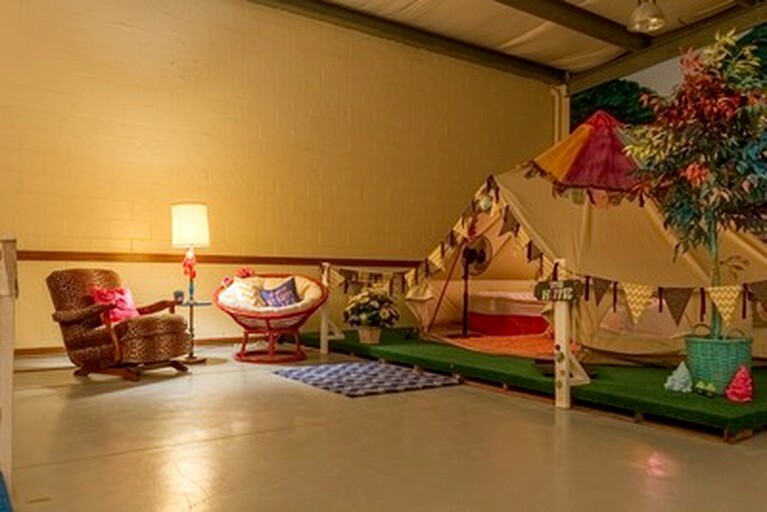 Set inside a one-of-a-kind indoor glamping site that replicates the experience of camping in the great outdoors within the context of a comfortable, climate-controlled environment, this bohemian bell tent is located near Bellville, Texas, and can accommodate two guests, making it perfect for a couples getaway. 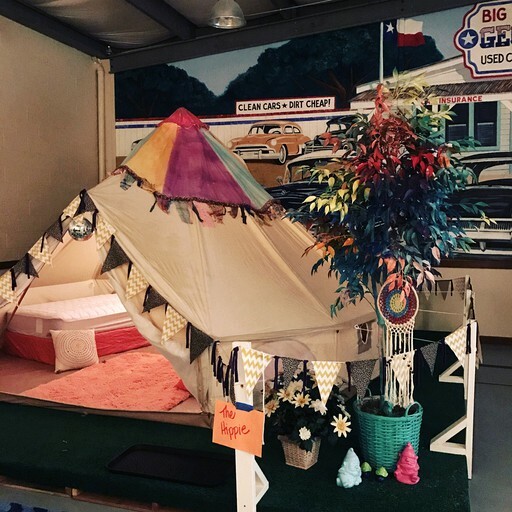 The exterior and entrance of the tent are decked out with hippie and '70s-themed decor, such as a dream catcher and a disco ball. By the tent, guests will find a seating area with two chairs and a lamp. The site's centrally located restroom and shower facilities provide guests with an upscale version of a campground bathhouse. In keeping with the camping concept of the site, guests should bring their own bedding, towels, and toiletries. Just as with outdoor camping, these items are not included with the tent—but unlike outdoor camping, the tent also does not include bugs, critters, and inclement weather! 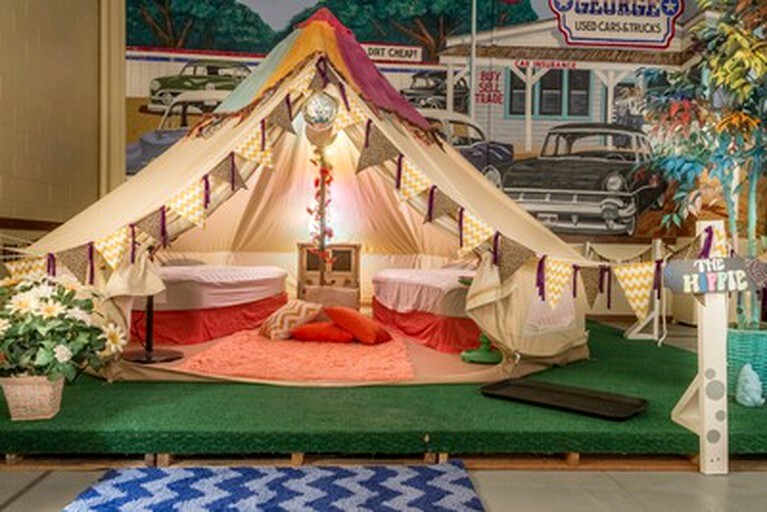 This glamping site is uniquely set inside a 15,000-square foot space within a building that hosts events and vendors during the Round Top Antiques Show. The site contains eight vintage campers and eight bell tents, each with its own little faux-yard space, and all of them arranged next to each other in rows with gaps between them, providing both a sense of personal space and a sense of communal space at the same time, just like at a campground. 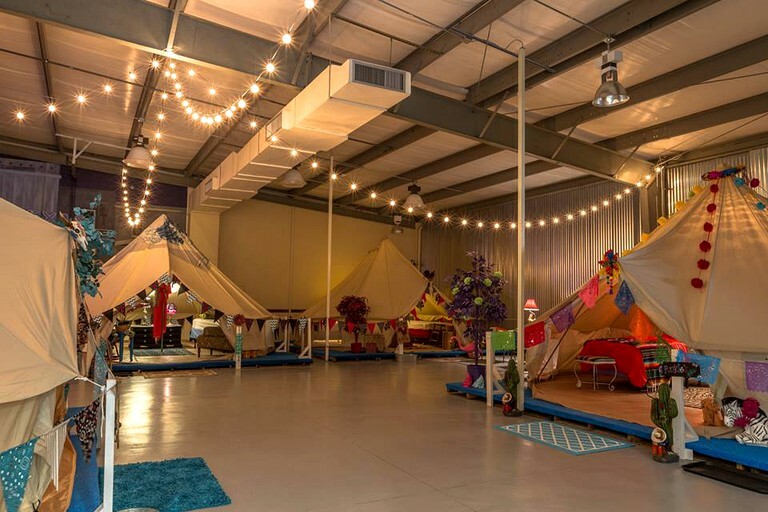 The site is dotted with potted artificial plants and outdoor furniture to further amplify the sense of indoor camping, and string lights are suspended from the vaulted ceiling to add a sense of magic to the overall ambiance. One of the virtues of this unique glamping site being indoors is that guests will never have to worry about coping with the weather or staying connected; the building in which it is housed is climate controlled with air conditioning and heating, and it is equipped with Wi-Fi, all of which guests can enjoy throughout the 15,000-square foot indoor site. At the site, guests will have access to a variety of shared facilities and amenities, in addition to the amenities inside their accommodation. These include centrally located, campground-bathhouse-like restroom and shower facilities, a kitchenette, a dining area, a social lounge, a television lounge, and a camp store. The kitchenette provides guests with a full-size refrigerator, a coffee maker, and a microwave. They will also have access to an outdoor grill. In the dining area, they will find an array of large, round tables where they can share meals and play games. Next to this area, they will also find the television lounge, which contains a big-screen television and seating. The social lounge features a set of three patio-style sofas arranged around a coffee table, all of which are set beneath a pavilion—the perfect place for guests to mingle. The camp store sells basic goods, providing convenient backup in case guests forget items such as razors. Outside, guests will find a garden area and ample free parking at the site's parking lot. This site can host large groups and special events. Please contact the host for more information. This unique indoor glamping site is located in Round Top, Texas, where it is situated in the Fayette County portion of the Texas Blackland Prairie Ecoregion. Here, guests will find a bucolic landscape consisting of gentle, rolling hills and flat fields dotted with oak trees and grazed by white-tailed deer. In the springtime, the fields become especially picturesque, as they blossom with bluebonnets, Indian paintbrush, Indian blanket, and black-eyed Susan wildflowers, speckling the countryside with countless flecks of blue, violet, red, and yellow in various vibrant hues. About 15 minutes to the south, guests will find Park Prairie Park on the northwest shores of Lake Fayette. The park is laced with biking and hiking trails, while the lake is full of largemouth bass, making it a popular destination among fishers. About 50 minutes to the north, guests will find Lake Somerville State Park and Trailway, which provides 13 miles of multi-use trails that connect the Birch Creek and the Nails Creek units of the park, all of which are centered around the 11,456-acre lake from which it gets its name. Guests will find even more opportunities for outdoor recreation here. Although Round Top is a very small town (population of 90, as of the most recent census) and the surrounding area is sparsely populated, they boast a surprising number of restaurants, art galleries, wineries, golf courses, museums, and antique stores, more details on which can also be found in the Activities section. Speaking of antique stores, one of the attractions for which Round Top and the surrounding area is most well-known is the Round Top Antiques Show, which draws hundreds of antique dealers and thousands of visitors from around the world for a week or two in the spring and fall each year. A shorter show is also held in the winter. Other attractions in Round Top include Moore's Fort, a dogtrot-style blockhouse that was built in 1823 by John Henry Moore, one of the first land grantees to settle in the part of Texas that belonged to Mexico at the time. Settlers used the blockhouse as a defensive fortification during Comanche raids. Guests can go hiking and biking on trails at Park Prairie Park, which is situated on the northwest shores of Lake Fayette, where they can go swimming, boating, canoeing, kayaking, and fishing for largemouth bass. They can also go hiking, biking, horseback riding, and birdwatching on more than 20 miles of trails at Lake Somerville State Park and Trailway, where they will also find facilities for playing volleyball, horseshoes, basketball, and badminton. At Lake Somerville itself, guests can fishing, canoeing, and kayaking. Canoes, kayaks, basketballs, volleyballs, and badminton equipment are available to rent at the Nails Creek and Birch Creek units of the park, while the latter also offers fishing equipment to borrow through the Angler Education Tackle Loaner Program. For even more outdoor recreation, guests can enjoy a disc golf course, basketball courts, volleyball courts, tennis courts, picnic areas, and walking trails at the parks of the City of Brenham's park system, such as Henderson Park, Jackson Street Park, and Hohlt Park. During scheduled weeks in the spring, fall, and winter, guests can attend the Round Top Antiques Show, and they can go antiquing throughout the year at the area's various antique stores, such as Old Depot Antiques and Tree Branch Ranch. For wine tasting, guests can visit Farmhouse Round Top, Rohan Meadery, Rosemary's Vineyard and Winery, Saddlehorn Winery, and Pleasant Hill Winery. Golfers can hit the links at Giddings Municipal Golf Course, Brenham Country Club, Bellville Golf and Recreation Club, The Falls Resort and Golf Club, Frisch Auf Valley Country Club, and Weimar Golf Club. For dining right in Round Top, guests can visit Los Patrones, Royers Round Top Cafe, the Stone Cellar and Round Top Dance Hall, Prost Wine Bar and Patio, and Bistro Napoletana. Other attractions to visit include Moore's Fort, Horseshoe Junction Family Fun Park in Brenham, and Peeka Ranch Alpacas, where guests will find 60 acres of oak tree-dotted hay meadows on which 100 alpacas roam.